A great big thank you goes out to Daisy Troop #8092 who spent their troop meeting tonight packing shoe boxes for foster kids. They made 20 care packages and even created drawings with special messages for the kiddos who will receive the care packages. Thanks ladies! The winter season is certainly upon us. We have had many questions regarding if clothing items are accepted by Project Shoe Box. We do accept clothing items that would fit any body type/size of a child in a particular age group such as socks, mittens, and hats. Please note we only accept new clothing items. 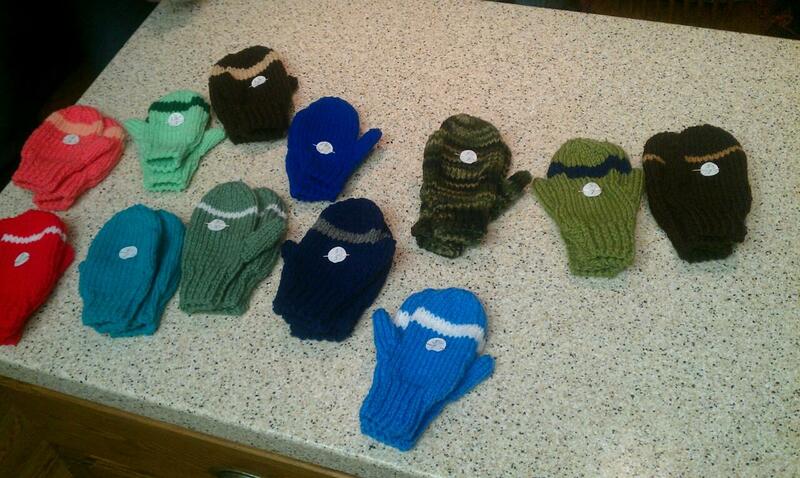 Check out the amazing handmade mittens we had donated! Thanks and Happy Holidays from the team at Project Shoe Box! We our gearing up for our first fundraiser at Pizzeria Piccola on Tuesday, December 4th from 4-9 p.m.  We will also during the month of November be holding a pre-sale for their delicious frozen pizza and soup! Be sure to check out the Project Shoe Box ad in the Journal Sentinel running from today though this Saturday, October 27th! We also need your vote to help win Milwaukee Journal Sentinel's: Partners for Humanity social media award. The ad with the most likes is awarded $500. That would supply over 80 care packages to foster children! Click 'here' and then hit like to make sure your vote is counted. This past week the donation drives organized by 414 Moms came to an end. The drives were a great successes! Thanks again to 414 Moms for supporting Project Shoe Box! Be sure to check out their great website at '414moms.com'. ZEN the salon teams up with PSB in September!